(Nanowerk News) Researchers designing and testing the 'classroom of the future' have found that multi-touch, multi-user desks can boost skills in mathematics. New results from a 3-year project working with over 400 pupils, mostly 8-10 year olds, show that collaborative learning increases both fluency and flexibility in maths. 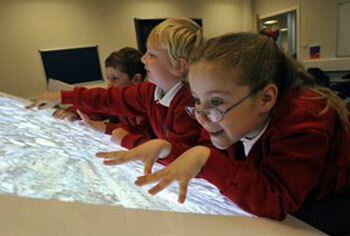 It also shows that using an interactive 'smart' desk can have benefits over doing mathematics on paper. This shows the SynergyNet classroom. Using multi-touch desks in the new classroom, the children were able to work together in new ways to solve and answer questions and problems using inventive solutions. Seeing what your friends are doing, and being able to fully participate in group activities, offers new ways of working in class, the researchers say. The 'Star Trek classroom' could also help learning and teaching in other subjects. The findings published in the journal Learning and Instruction, show that children who use a collaborative maths activity in the SynergyNet classroom improve in both mathematical flexibility and fluency, while children working on traditional paper-based activities only improve in flexibility. During the project, the team found that 45% of students who used NumberNet increased in the number of unique mathematical expressions they created after using NumberNet, compared to 16% of students in the traditional paper-based activity. Lead researcher, Professor Liz Burd, School of Education, Durham University, said: "Our aim was to encourage far higher levels of active student engagement, where knowledge is obtained by sharing, problem-solving and creating, rather than by passive listening. This classroom enables both active engagement and equal access. "We found our tables encouraged students to collaborate more effectively. We were delighted to observe groups of students enhancing others' understanding of mathematical concepts. Such collaboration just did not happen when students used paper-based approaches." The Durham University team designed software and desks that recognize multiple touches on the desktop using vision systems that see infrared light. The project called SynergyNet set out to integrate a fully collaborative system of desks, building it into the fabric and furniture of the classroom. The new desks with a 'multi-touch' surface are the central component, and these are networked and linked to a main smartboard. In terms of current teaching, the new system means that the 'move-to-use' whiteboard is by-passed and the new desks can be both screen and keyboard. The desks act like multi-touch whiteboards and several students can use any one desk at once. The technology allows all students to take part as opposed to one individual dominating. Researcher, Emma Mercier, School of Education, Durham University, said: "Cooperative learning works very well in the new classroom because the pupils interact and learn in a different way. The children really enjoy doing maths in this way and are always disappointed when you turn the desks off! "We can achieve fluency in maths through practice, however, boosting a pupil's ability to find a range of solutions to arithmetic questions is harder to teach. This classroom can help teachers to use collaborative learning to improve their pupils' flexibility in maths." The teacher plays a key role in the classroom and can send tasks to different tables to individuals and groups. The teacher can also send one group's answers on to the next group to work on and add to, or to the board for a class discussion. A live feed of the desks goes directly to the teacher who can intervene quickly to help an individual while allowing the group work to continue. Professor Steve Higgins said: "Technology like this has enormous potential for teaching as it can help the teacher to manage and to orchestrate the learning of individuals and groups of learners to ensure they are both challenged and supported so that they can learn effectively." Such a classroom may be some way off being a regular feature of schools across the world due to the costs in setting it up, and the level of support needed to make it work, however, in just 3 years the project team have noted major improvements in the technology, and a reduction in costs. The researchers also recognise that task management in the class environment is an issue requiring thought and planning, but the overall potential of the new classroom for improved numeracy, learning, and on-going assessment is very good. The project has worked with 12 different schools in the North East. SynergyNet is one of eight technology enhanced learning research projects funded by the ESRC and EPSRC as part of the ?12M Teaching and Learning Research Programme into Technology Enhanced Learning. The project is an inter-disciplinary collaboration at Durham University between the School of Education, the Department of Psychology and the Department of Computer Science.